William F. Gallagher, 23 son of William L. and Linda Gallagher and grandson fo Frances “Donnie” Gallagher obtained an Associate degree in Applied Science, and on May 3 joined the family’s business - the Gallagher Funeral Home. He thus becomes the thrid generation Gallagher in the family business. 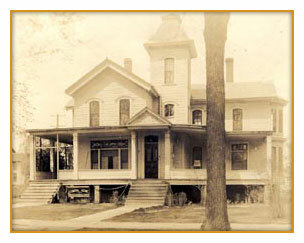 The business began in 1927 at 217 Congress St., Oconto by the late William J. Gallagher. The funeral home itself was a private home built in the 1860's by the late William H. Young, a former Oconto mayor and a Colonel during the Civil War. Young’s daughter, Ina, married George Gallagher, father of the late William. William operated the business at the location after having worked for Donald MacQueen, a local funeral director and furniture store owner. William had graduated from Oshkosh Normal School but taught manual arts just one week, before deciding to become a funeral director. In about 1940 William’s wife, the former Frances "Donnie" Beekman obtained her funeral director’s license, then her embalmer’s license and in 1991 received a 50 year service award from the state. The Gallaghers added a main chapel at the front of the home in 1976 and about 3 years ago completely redecorated the facility. One room has been redone in Victorian style using many of the family’s antiques. "Donnie" said there’s been many changes in the business during her time. In the early 1940's the deceased were viewed at home and services conducted there. All of the equipment form the funeral home including flower holders, biers, drapery, chairs and lamps were taken to the homes for two or three nights of viewing the body. When the family left for the cemetery, all the items needed to be removed quickly, so nothing was left when they returned. The Gallaghers indicated a change in government regulations has also occurred. Prices are now regulated as are health standards. “A very large portion of our business now, includes pre-financing and pre-arranging of funerals,” said Bill. His wife, the former Linda Nerenhausen, assists with many of the arrangements and much of the paperwork. “One of our chief endeavors is keeping the family comfortable,” she said indicating one of the reasons for refurbishing the funeral home was to provide a family atmosphere. “The funeral business is our family’s only business and we strive to give each family special and personal attention,” Bill said. Being life-long local residents hasn’t made the work any easier. “The community is our extended family. It is especially difficult the longer we are in business to lay away old friends,” stated the Gallaghers. Another difficult situation is at the time of death of infants and children. "Donnie" and her late husband have a daughter Jean Richards, a special education teacher at Arcadia, Florida. Bill and Linda are also parents of three daughters, Patti Jo Domask, a registered nurse at Plainview, Minnesota; Paula Moe, a physical education instructor at Mauston; and Missy, a senior in high school. The Gallaghers have also been foster parents to Jeanette Sachse three years, who is also a senior in high school. In 1988, they hosted Memo Hernandez, an American Field Service exchange student from Mexico. “Donnie” sets an example for her family by staying busy and active. She has been church organist and choir director at First American Lutheran Church for several decades. She is a 50-year member of both the Rebekahs and Eastern Star and enjoys golfing and bowling. Bill is a council member at First American Lutheran Church, serves as president of the Oconto Industrial Fund and the Oconto Gun Club, is a member of the Masons, Odd Fellows, Lions, Oconto County Shrine Club, a board of directors member of the Oconto Area Chamber of Commerce and Oconto Business Association. Linda’s community involvement includes Oconto Woman’s club, American Field Service chapter, Chamber of Commerce, a board of directors member for the Oconto Skiing Patriots, a seventh grade confirmation instructor and is involved in many school activities. Their son Bill has been a member of the Oconto Skiing Patriots the last ten years, and both he and his dad are certified eye enuculators.